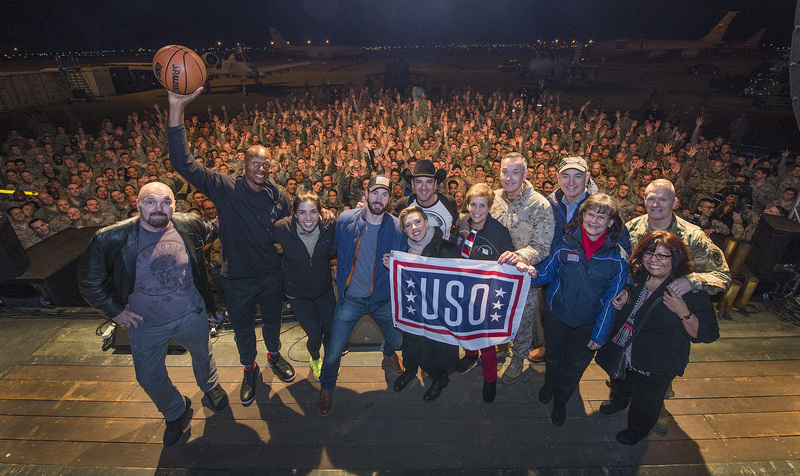 A legacy that began 16 years ago when the USO first partnered with the Office of the Chairman of the Joint Chiefs of Staff -- the Chairman's USO holiday tour delivered a much-needed break to more than 3,000 service members stationed in Turkey, Qatar, Afghanistan and Germany. As part of the trip, the group visited five bases, toured nearly a dozen military units, hosted four variety shows and brought cheer to virtually every branch of the Armed Forces. While on the ground, the group met with an explosive ordinance disposal team; toured inside multiple military aircraft; spoke with an operational maintenance crews and a missile brigade; visited with Wounded Warriors; participated in a security forces K-9 demonstration, and performed four USO shows. This year's trip marks the second USO tour for General Dunford, Johansson and Campbell -- who have collectively visited seven countries and entertained more than 7,000 service members and their families since '2008. The tour is the first USO experience for Evans, Allen, DiRado and Karol. Earlier this year, the USO launched Force Behind the Forces, a brand awareness campaign encouraging Americans to stand in support of service members and military families. Supporters are asked to join the USO, General Dunford and all the stars featured on this year's tour by visiting USO.org/FORCE to learn how they, too, can become a Force Behind the Forces. A native of New York, Scarlett Johansson made her professional acting debut at the age of eight in the off-Broadway production of "Sophistry." Since then, the Tony Award-winning actress and four-time Golden Globe nominee has starred in more than fifty films. The actress most recently reprised her role as 'Natasha Romanoff / Black Widow' in "Captain America: Civil War" as well as Disney's "The Jungle Book." The highest-grossing actress of all time, Johansson can soon be heard in the computer-animated musical comedy "Sing" in theaters this month and just wrapped filming of "Ghost in the Shell," set for release in 2017. Among some of her many film and theater credits are "Lucy," "Under the Skin," "Her," "Lost in Translation," "Chef," "The Avengers," "Don Jon," "Hitchcock," "We Bought A Zoo," "Iron Man 2" and "In Good Company." One of Hollywood's most in-demand actors, Chris Evans recently reprised his role as the famed Marvel Comics character 'Steve Rogers' in "Captain America: Civil War" -- the highly anticipated third installment to 2011's "Captain America: The First Avenger" and 2014's "Captain America: The Winter Soldier," and 2016's top grossing film. Evans marked his feature film directorial debut with "Before We Go," which he also produced and starred in. Among some of the actor's many film credits "Snowpiercer," "The Iceman," "Scott Pilgrim vs. the World," "Puncture," "Push," "Street Kings" and "Fantastic Four: Rise of the Silver Surfer." Coming up, Evans can be seen in "Gifted." One of the best shooters in basketball history, Ray Allen announced his retirement from the NBA in November 2016. A former star for the Milwaukee Bucks (1996-2003), Seattle SuperSonics (2003-2007), Boston Celtics (2007-2012) and Miami Heat (2012-2014), Allen walked away from the game as a two-time NBA champion, ten-time All-Star, Olympic gold medalist and career leader in both regular-season and playoff 3-pointers. The son of an airman, Allen was born at Castle Air Force Base and grew up moving around the world throughout his adolescence, to include stints at Bentwaters Air Force Base in England, Ramstein Air Base in Germany, Edwards Air Force Base in California and Altus Air Force Base in Oklahoma, among other installations. Craig Campbell launched onto the country music scene in 2011 and has quickly become one of country's brightest stars. Born in Georgia, the critically acclaimed singer/songwriter played piano at his mother's Baptist church for eight years starting at the age of 10. Among his many hit songs are "Keep Them Kisses Comin'," "Fish," "Family Man" and "Outskirts of Heaven." To date, he has logged five consecutive charted hits with over a billion radio airplay audience impressions and over a half million downloads. He is currently in the studio working on his RED BOW Records' debut -- and third career -- album. Earlier this year, Campbell visited nearly 2,000 troops and military families stationed on both the East and West coast as part of a Grand Ole Opry/USO 75th Anniversary tour and has been touring nationwide, opening for Randy Houser, Alan Jackson, The Band Perry, Justin Moore and more. Olympic swimming champion Maya DiRado was a breakout star at the 2016 Olympic Games in Rio, Brazil. The San Francisco native won four medals - a gold in both the 200-meter backstroke and 800-meter free relay, a silver in the 400-meter individual medley and a bronze in the 200-meter individual medley. A renowned mentalist/entertainer, Jim Karol has performed on and appeared in countless television shows, venues and films around the world. In addition to setting Guinness World Records for both physical and mental feats, he is the author of "Beyond Emotional Intelligence" and "51 Ways to Hustle Your Friends." Among his favorite pastime is working with the USO of Metropolitan Washington - Baltimore and visiting the Walter Reed National Military Medical Centers to help Wounded Warriors with post-traumatic stress disorder by teaching them cognitive fitness techniques to improve memory, enhance emotional intelligence, optimize health, and maximize all aspects of their performance. "General Dunford's support of the USO and our mission of connection is unwavering. Whether honoring troops and their families at USO events or spearheading USO tours abroad -- he and his wife, Ellyn, go above and beyond to keep our service members connected to the things they love and fight for. The Chairman's holiday tour is a wonderful example of this commitment and his desire to help the USO provide meaningful moments to those serving far from home." "It is a true honor to be invited back to visit our troops abroad and to help the USO celebrate the 75th anniversary of its important work. My first USO experience nearly eight years ago in Kuwait was filled with life long memories; meeting America's finest and bravest, hearing their stories and letting them know that we are eternally grateful for their service. It is my great pleasure to have the opportunity to thank our troops in person and send them love and support from home." "Each and every day our nation's troops are making a real difference and I am endlessly grateful for everything they are doing for us back home. It is people like them - those who put on the uniform every morning, serve our nation and sacrifice their lives - that make people like me want to be a better person. A huge thank you to everyone serving our nation, to the Chairman of the Joint Chiefs for giving me this opportunity and the USO for making tours like this even possible. It is a real honor." "A lot of who I am today is because of my military upbringing. Even though I frequently moved and always had to make new friends, I always felt comfortable on a military base. We dressed the same, we spoke the same and we shared a lot of the same experiences. Many of my friends then are considered my good friends today and I'm honored to be out visiting troops and military families with the Chairman and the USO this holiday. It really feels like I am at home." "I had a great time visiting and performing for our nation's service members and military families just a few months ago with the USO. I am having just as much fun today and I can't thank the Chairman or the USO enough for having me back. It really means a lot to have the opportunity to give back to those who give so much." "This year has been a real whirlwind experience, from the 2016 Olympic Games in Rio to being invited by the Chairman of the Joint Chiefs of Staff to visit troops and their families around the world on this year's USO holiday tour. It's hard to think that anything could really top these last few months but just being here and getting the opportunity to hear about all the important work our servicemen and women do, to listen to their stories and to see their sacrifice up close is truly life-changing. I've learned a great deal and can't thank everyone enough for having me." "I've always been a big supporter of the USO. I've worked a lot with one of their local chapters, the USO of Metropolitan Washington-Baltimore, where I've visited and spoken one-on-one with wounded warriors. I so grateful to have been invited by General Dunford to travel on this year's trip and visit troops and military families all over the world this holiday." The USO strengthens America's military service members by keeping them connected to family, home and country, throughout their service to the nation. At hundreds of locations worldwide, we are united in our commitment to connect our service members and their families through countless acts of caring, comfort, and support. The USO is a private, non-profit organization, not a government agency. Our programs, services and entertainment tours are made possible by the American people, support of our corporate partners and the dedication of our volunteers and staff. In addition to individual donors and corporate sponsors, the USO is supported by President's Circle Partners: AT&T, the BNSF Railway Foundation, Clark Construction Group, LLC, The Coca-Cola Company, FedEx, Jeep, Johnson & Johnson, Kroger, NFL, Southern New Hampshire University and Four-Star Partners: Advisors Excel, BIC, ConAgra Foods, GEICO, Harris Teeter, Lockheed Martin, Microsoft, Starbucks, TKS, USAA and the Wawa Foundation. We are also supported through the United Way and Combined Federal Campaign (CFC-11381). To join us in this important mission, and to learn more about the USO, please visit uso.org.